Welcome to the City of Walhalla Water and Sewer Department. Below is some useful information about our policies, procedures, fees, and contact information. ALL account changes or applications for new service require a photo ID and MUST be done in person at City Hall. We cannot take name change or address change requests over the phone or via email. Please see the New Water/Sewer Service tab for more information. If you have any questions or problems please call us at 864-638-4343. All active accounts are billed monthly, and all payments are due by the 10th of each month. Billing starts the day your service is activated. If you have misplaced or have not received your bill, please call City Hall at (864) 638-4343, and we will be glad to help you. The City is not responsible for loss of your bill in the mail. If you feel there is a mailing error, and the account address is listed correctly, we recommend that you contact the US Postal Service. If payment is not received by the 10th, a 10% penalty is added to the balance. After the 20th, a $65 penalty is added, and the account is subject to disconnection. If the account is not paid, and the water has been turned back on by the customer, the meter will be removed, and a $250 tampering fee will be added. The account will continue to be billed, even if the service has been discontinued for non-payment. If you have questions about the water usage shown on the bill, please read your meter and compare the reading with the current reading on the bill. Every effort is made to insure a correct reading prior to billing, but mistakes can still be made. If there is a bad reading shown on the bill, the bill will be adjusted for the correct reading. All disputes must be presented BEFORE the 10th to avoid penalties. To establish new water and sewer service within the City of Walhalla service area, the following steps must be taken. All applications for new service MUST be done in person, at City Hall. Proof of ownership or a rental agreement must be provided. Each document must have the property address and the applicant’s name. TAX MAP NUMBERS OR TAX RECEIPTS WILL NOT BE ACCEPTED as proof of ownership. All prior balances of the applicant must be paid prior to establishing new water service. For same-day service, requests for new service after 3:00PM will be charged an additional $25. All rental properties inside the City limits must be inspected by the Walhalla Fire Department prior to connection of services. All applications for new service require either proof of property ownership, or a copy of a rental agreement or rental receipt. The information must include the address of the property to be served, and the applicant’s name. For same day service after 3:00PM, there will be a $25 surcharge. The cost of relocating a water meter is determined on a case by case basis. If the distance is more than 15 feet, then a new tap is required. For moves of less than 15 feet, a cost will be calculated based on site conditions and material costs. The fee must be paid before the work is done. The customer will be responsible for reconnection of the service line to the meter. I. Inside City – $5.00 for 1st 1000 gallons, $4.50 above 1000 gallons; 1000 gallons minimum. II. Outside City – $6.80 for every 1000 gallons used. III. Inside City – $4.12 for 1st 100,000 gallons, $2.93 above 100,000 gallons. IV. Outside City – $5.18 for 1st 100,000 gallons, $4.12 above 100,000 gallons. Municipal $7.00 per 1,000 gallons. TO OBTAIN A NEW WATER AND/OR SEWER TAP, AN APPLICATION FORM MUST BE SUBMITTED. THE FOLLOWING INFORMATION WILL BE REQUIRED TO APPLY FOR A NEW TAP. Forms are available at City Hall, 206 N. Church St, Walhalla, or you can download the form here. No money will be accepted at the time of application, unless the water tap is pre-made (A Box Already in Place, Ready For The Meter). You will be given a flag to mark the desired location of the tap. Once the site has been inspected and the location verified, you will be asked to pay for the tap. For a sewer tap, the site must be flagged and inspected. After inspection, a Service Accessibility Form will be submitted to the Oconee Joint Regional Sewer Authority. The OJRSA’s impact fees must be paid PRIOR to paying for the sewer tap. After payment of the tap fees, a workorder will be made and the tap will be made in the order in which it was received. The City will make every effort to place the tap within 2 weeks of purchase, but, emergency repairs and weather can extend the timeline. After installation, all new taps will be billed monthly, regardless of usage. Sooner or later, everyone will have a water leak. The best indication of a leak is a sudden increase in your bill, without a change in your day to day routine. If your consumption increases by 25% or more in a month for no apparent reason, it’s time to check for leaks. As a courtesy to our customers, we will send you a letter if we think you may have a leak. Watch your meter. If the meter is steadily turning, when everything is turned off, then you most likely have a leak in a line leading to the house, or inside the house. These leaks typically get worse over time. If the meter is not turning steadily, watch it for 5 – 10 minutes. If it begins turning, runs a few seconds, then stops again, you have a toilet leaking and re-filling. This can be verified by placing food coloring in the tank of the toilet, and waiting for the color to appear in the bowl. Leaking toilets normally require a new flapper valve. The City of Walhalla Water Department prepares a Consumer Confidence Report each year for its customers. This report is mailed to each active account during the month of June. We now have an online version available for viewing here, simply click the attachment link below for the year you wish to view. Please call City Hall at (864) 638-4343 if you have any questions about the report. 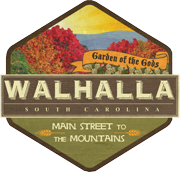 The City of Walhalla Water and Sewer Department operates under the supervision of the Walhalla City Council. The City Council sets the policies and procedures of the Department. The Council also adopts Ordinances which set the guidelines for day to day operations. Information covering the most common activities are outlined on the pages listed below, and the full ordinances for water and sewer are also available below. I. Inside City – $4.14 for 1st 5000 gallons, $2.93 above 5000 gallons; 1000 gallons minimum. II. Outside City – $6.24 for 1st 5000 gallons, $4.12 above 5000 gallons; 1000 gallons minimum.